The intricate designs and celebration of nature make floral rings an ideal choice for the romantic bride. Floral-motif fans include Penelope Cruz and Nikki Reed. These flower-inspired sparklers are anything but garden variety. ￼Platinum floral ring with pavé band by Tacori. 18k white gold diamond ring with “floating” floral halo by Parade Design. Diamond cluster ring with 18k white gold petals by Hearts on Fire. 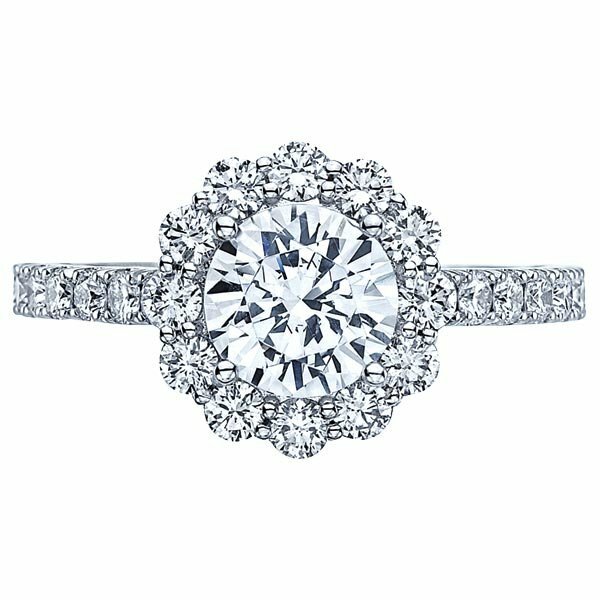 White gold floral diamond halo ring with pavé band by Sylvie Collection. Pink diamond “rose” ring with marquise diamond leaves by De Beers. Diamond and blue sapphire swirl ring in white gold by Vera Wang Love. ￼Platinum ring with “floating” petal halo and round center stone by Cliq.